Boost Converter with Active Snubber Network, HIMMELSTOSS, F. A., DERIN, A. R., CERNAT, M.
HIGH: A Hexagon-based Intelligent Grouping Approach in Wireless Sensor Networks, FAN, C.-S.
Design Options for Current Limit and Power Limit Circuit Protections for LDOs, PLESA, C.-S., DIMITRIU, B., NEAG, M.
 I. Cox, M. Miller, J. Bloom, J. Fridrich, and T. Kalker, Digital watermarking and steganography: Morgan Kaufmann, 2007. W. Bender, D. Gruhl, N. Morimoto, and A. Lu, "Techniques for data hiding," IBM systems journal, vol. 35, pp. 313-336, 1996. A. Poljicak, G. Botella, C. Garcia, L. Kedmenec, and M. Prieto-Matias, "Portable real-time DCT-based steganography using OpenCL," Journal of Real-Time Image Processing, pp. 1-13, 2016. V. Solachidis and I. Pitas, "Circularly symmetric watermark embedding in 2-D DFT domain," IEEE Transactions on Image Processing, vol. 10, pp. 1741-1753, 2001. S. H. Amiri and M. Jamzad, "Robust watermarking against print and scan attack through efficient modeling algorithm," Signal Processing: Image Communication, vol. 29, pp. 1181-1196, 2014. P. Bas, J.-M. Chassery, and B. Macq, "Image watermarking: an evolution to content based approaches," Pattern recognition, vol. 35, pp. 545-561, 2002. H. S. Malvar and D. A. Florêncio, "Improved spread spectrum: a new modulation technique for robust watermarking," IEEE Transactions on Signal Processing, vol. 51, pp. 898-905, 2003. W. Wan, J. Liu, J. Sun, C. Ge and X. Nie, "Logarithmic STDM watermarking using visual saliency-based JND model," in Electronics Letters, vol. 51, no. 10, pp. 758-760, 5 14 2015. T. Bianchi and A. Piva, "Secure Watermarking for Multimedia Content Protection: A Review of its Benefits and Open Issues," in IEEE Signal Processing Magazine, vol. 30, no. 2, pp. 87-96, 2013. F. Ros, J. Borla, F. Leclerc, R. Harba, and N. Launay, "An industrial watermarking process for plastic card supports," ICIT 2006. IEEE International Conference on Industrial Technology, 2006, pp. 2809-2814. J. F. Lichtenauer, I. Setyawan, T. Kalker, and R. L. Lagendijk, "Exhaustive geometrical search and the false positive watermark detection probability," Proc. SPIE 5020, Security and Watermarking of Multimedia Contents V, p. 203, 2003. S. Pereira and T. Pun, "Robust template matching for affine resistant image watermarks," IEEE Transactions on Image Processing, vol. 9, pp. 1123-1129, 2000. A. Poljicak, L. Mandic, and D. Agic, "Discrete Fourier transform-based watermarking method with an optimal implementation radius," Journal of Electronic Imaging, vol. 20, pp. 033008-033008-8, 2011. A. Poljicak, L. Mandic, and M. S. Kurecic, "Improvement of the watermark detector performance using image enhancement filters," in Systems, Signals and Image Processing (IWSSIP), 2012 19th International Conference on, 2012, pp. 68-71. L. Yu, X. Niu, and S. Sun, "Print-and-scan model and the watermarking countermeasure," Image and Vision Computing, vol. 23, pp. 807-814, 2005. R. Riad, R. Harba, H. Douzi, M. El-hajji, and F. Ros, "Print-and-scan counterattacks for plastic card supports Fourier watermarking," in IEEE 23rd International Symposium on Industrial Electronics (ISIE), pp. 1036-1041, 2014. A. Keskinarkaus, A. Pramila, T. Seppänen, "Image watermarking with feature point based synchronization robust to print-scan attack," Journal of Visual Communication and Image Representation, vol. 23, no. 3, pp. 507-515, 2012. X.-Y. Wang, Y.-N. Liu, S. Li, H.-Y. Yang and P.-P. Niu, "Robust image watermarking approach using polar harmonic transforms based geometric correction," Neurocomputing, vol. 174, Part B, pp. 627-642, 2016. H.-Y. Yang, X.-Y. Wang, P.-P. Niu, and A.-L. Wang, "Robust Color Image Watermarking Using Geometric Invariant Quaternion Polar Harmonic Transform," ACM Trans. Multimedia Comput. Commun. Appl., vol. 11, pp. 1-26, 2015. Z. Shao, Y. Shang, Y. Zhang, X. Liu, and G. Guo, "Robust watermarking using orthogonal Fourier-Mellin moments and chaotic map for double images," Signal Processing, vol. 120, pp. 522-531, 2016. M. Ali and C. W. Ahn, "An optimized watermarking technique based on self-adaptive DE in DWT-SVD transform domain," Signal Processing, vol. 94, pp. 545-556, 2014. A. Cheddad, J. Condell, K. Curran, and P. Mc Kevitt, "Digital image steganography: Survey and analysis of current methods," Signal processing, vol. 90, pp. 727-752, 2010. C. Strauss, F. Pasteau, F. Autrusseau, M. Babel, L. Bédat, and O. Déforges, "Subjective and objective quality evaluation of lar coded art images," IEEE International Conference on in Multimedia and Expo ICME 2009, pp. 674-677, 2009. M. Carnec, P. Le Callet, and D. Barba, "Objective quality assessment of color images based on a generic perceptual reduced reference," Signal Processing: Image Communication, vol. 23, pp. 239-256, 2008. P. Le Callet, F. Autrusseau, and P. Campisi, "Visibility control and quality assessment of watermarking and data hiding algorithms," Multimedia Forensics and security, pp. 163-192, 2008. M. L. Miller and J. A. Bloom, "Computing the probability of false watermark detection," in Information Hiding, pp. 146-158, 1999. C.-Y. Lin, M. Wu, J. A. Bloom, I. J. Cox, M. L. Miller, and Y. M. Lui, "Rotation, scale, and translation resilient watermarking for images," IEEE Transactions on Image Processing, vol. 10, pp. 767-782, 2001. C.-Y. Lin and S.-F. Chang, "Distortion modeling and invariant extraction for digital image print-and-scan process," in Proceedings of International Symposium on Multimedia, 1999. A. Malvido, F. Pérez-González, and A. Cousiño, "A novel model for the print-and-capture channel in 2D bar codes," in Multimedia Content Representation, Classification and Security, ed: Springer, 2006, pp. 627-634. 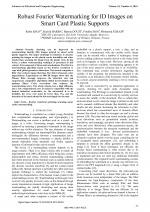 R. Riad, M. El Hajji, H. Douzi, R. Harba, and F. Ros, "Evaluation of a Fourier Watermarking Method Robustness to Cards Durability Attacks," in Image and Signal Processing, ed: Springer, 2014, pp. 280-288. Z. Sharif and A. Z. Sha'Ameri, "The application of cross correlation technique for estimating impulse response and frequency response of wireless communication channel,", SCOReD 2007. in 5th Student Conference on Research and Development, 2007, pp. 1-5. F. Luisier, T. Blu, and M. Unser, "Image denoising in mixed Poisson-Gaussian noise," IEEE Transactions on Image Processing, vol. 20, pp. 696-708, 2011. C. Liu, R. Szeliski, S. B. Kang, C. L. Zitnick, and W. T. Freeman, "Automatic estimation and removal of noise from a single image," IEEE Transactions on Pattern Analysis and Machine Intelligence, vol. 30, pp. 299-314, 2008. 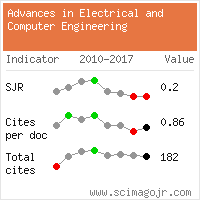 Citations for references updated on 2019-04-22 10:48 in 204 seconds.